We eat a lot of cereal in our house. On school mornings, I want my kids to have a good, convenient breakfast before the day of learning ahead of them. But on the weekends, I want to have a little something different. Maybe even a little splurge or treat could be on the menu. My kids love to bake with me. Not only do we spend some time together, I use the baking process as a learning experience. With all the measuring, stirring and baking, the kids can learn about a variety of subjects. Most importantly, we get to eat what we produced. Since our family always likes to try new products, I jumped at the chance to try the new Betty Crocker Cereal Muffin Mixes. My kids and I love Cinnamon Toast Crunch and Cocoa Puffs. The idea of these favorite flavors in a muffin was extremely tempting. Personally I love the taste of Cinnamon Toast Crunch. I baked these muffins for my family. First the smell from the oven was divine. The spicy cinnamon smell wafted throughout the house. After letting them cool for a few minutes, I ate a warm one out of the oven. With my big glass of milk, I was smitten with these muffins. One box of muffin mix makes 12 muffins. The streusel topping was just like eating the crunchy parts of these cereals. I'm looking forward to having a few of these boxes on hand over the long weekend to give my kids as a special breakfast treat or a lunchtime special treat. Would you like to try the NEW Betty Crocker Cereal Muffin Mixes? Here's a coupon that will get you $0.80 off a box. Want more? 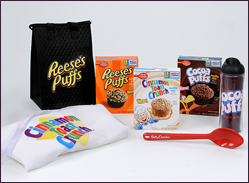 I'm giving away a Betty Crocker Prize Package. Start your day off with a treat. Try a Betty Crocker Cereal Muffin Mix today! The Reese's Puff for sure. I would love to try the Reese's puffs! I think I'd like the Reese's Puffs muffins. I think the Cinnamon Toast Crunch sounds delicious. Like a coffee cake! the Cinnamon Toast crunch. Thanks! I can't wait to try Reese's Puffs. I would love the Reese's Puffs Cereal Muffins, they sound delicious! Thanks so much for hosting this great giveaway! I think the Cinnamon Toast Crunch sounds good to me. The Reeses Puffs looks great! I'd like cocoa puffs. Thanks for the giveaway. Reese's Puffs would be my muffin of choice! cinnamon toast crunch would be best for us. I would like to try Reese's Puffs. Would love to try the Cinnamon Toast Crunch muffins most! I would like to try the Cinnamon toast crunch! I would love to try the Cocoa Puffs. I would try the cocoa puff mix first. I want to try cinnamon toast crunch. I want to try the Cocoa Puffs mix! I would love to try the Cinnamon Toast Crunch. Love those Cinnamon toast crunch. Thanks! I would like to try the Cocoa Puffs muffin mix.